This weekend #TrumpRussia continued to unfold. And Trump's popularity continued to falter (now just 34%). And while we learned some really troubling news about Carter Page knowingly working with Russian spies, the bigger story is emerging from the weeds. To set the stage, let's look at this AP report on civilian casualties. WASHINGTON (AP) — Week by week, country by country, the Pentagon is quietly seizing more control over warfighting decisions, sending hundreds more troops to war with little public debate and seeking greater authority to battle extremists across the Middle East and Africa. This week it was Somalia, where President Donald Trump gave the U.S. military more authority to conduct offensive airstrikes on al-Qaida-linked militants. Next week it could be Yemen, where military leaders want to provide more help for the United Arab Emirates' battle against Iranian-backed rebels. Key decisions on Iraq, Syria and Afghanistan are looming, from ending troop number limits to loosening rules that guide commanders in the field. The military is operating on what sports fans would call a "soft cap." It's a restriction, sure, but there are loopholes. While we are trying to keep numbers relatively low, if the Pentagon wants to go into Somalia, they tell Trump, he declares it a "war zone" and they send in a small contingent. Trump further backs them by eliminating safeguards for civilians. But what happens when they need more bodies out there? We call in mercenaries. It's really easy to scale down official troop presence when you replace US soldiers with highly paid contractors mercenaries. Just how highly paid? A report during the height of the Afghan war, when we had nearly 100,000 mercenaries on the ground found that we were spending between $15,000 and $22,500 per merc per month. For ease of math, let's assume that they averaged $20,000. That means we were spending $2 billion per month on mercenaries in Afghanistan. Someone was clearly getting rich off of the war and it wasn't the Afghani or American people. @Celeste_pewter @tgconsolidation This feels like it has Prince's fingerprints all over it. The big winners here are the mercenaries. 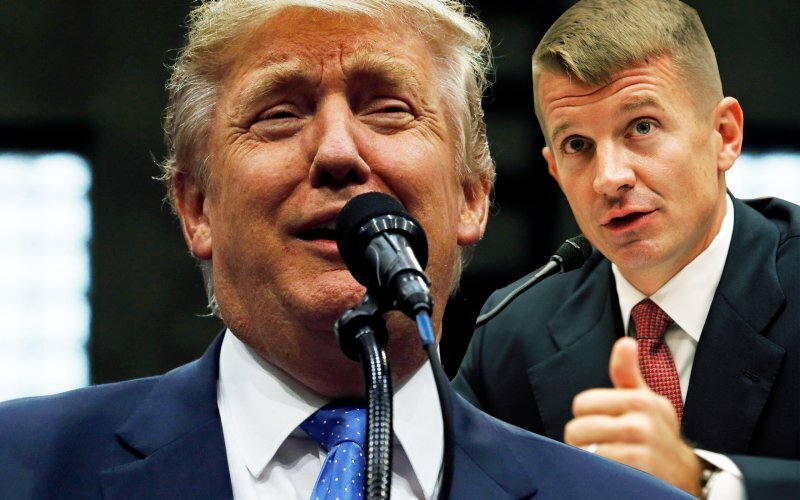 Let's review a couple of facts about Erik Prince. 1. His company Blackwater was embroiled in scandals due to overzealous mercanaries displaying no regard for civilian lives in Iraq. 4 Blackwater employees were convicted. Nothing happened to Prince. 2. So who is this guy? First off, he's a zealot. A true Christianist in every sense of the word. He has a relationship with many religious groups and as a secret advisor to Trump, he was responsible for many cabinet appointments -- including the appointment of his sister, and fellow Christianist, Betsy DeVos to the Department of Education. 3. So how does that make him any different, than say Mike Pence? In some ways it doesn't, but in others there is clearly a major difference. Pence wants Christianity to first shape and eventually subsume American culture. Prince is basically trying to carry out a modern day Crusade complete with the blood of the innocents being spilled on the streets. 4. He's also greedy beyond belief. In order to avoid any further issues like he had gone through with the Blackwater scandal, he disavowed his US citizenship and left. He declard his intent to stop paying US taxes and managed to become a citizen of Abu Dhabi by setting up a secret army for them to use to take out political dissidents. The bulk of the soldiers? 800 former FARC and other rebel Columbians. And it's there in Abu Dhabi where our story really begins. On January 11, the UAE set up a meeting between Prince and a Russian oligarch close to Trump Daddy Vladi. The media caught wind of it and questioned Dumb Spice in one of his first press briefings. Spicer denied everything. So the meeting was chalked up to Prince trying to build support for his sister Betsy as well as to solidify his relationship with Trump. But as we've now learned, it was far more than that. Trump was already feeling the heat about his dealings with Putin and needed a workaround. Prince gave it to him. And in exchange, he's now given Prince the keys to the vault. @randyprine @karenberan Somewhere Erik Prince is sipping a $500 shot of scotch while talking to his sister Betsy about how much money their family is about to make. The Kleptocrats have moved out of the shadows and are officially running the show. Now is where the media needs to step up their game and put the pieces together before it's too late and we're embroiled in another pointless war in a Muslim country so Erik Prince can make another billion dollars.